Imagine having a “day job” where you get to perform four times a week for an audience of around 2 million people. When you’re not doing that, you’re an in-demand session and touring musician working with a diverse array of artists like James Taylor, Frank Ocean, Neil Young, Willie Nelson, Smokey Robinson, Alanis Morrisette, and Toto. And, just for fun, you make regular live appearances with some of the leading lights of modern improvisational music. That only begins to describe keyboardist and coffeephile Jeff Babko. Since 2003, Jeff has been the keyboard player in the Cletones, the house band on the late-night talk show “Jimmy Kimmel Live,” where he also serves as musical arranger, as well as composing and producing music for various comedy segments. A Southern California native, he has also realized his near-lifelong dream of being a sideman and session musician. One of his most recent appearances is on the latest M83 album, “Junk.” If you’re in Los Angeles, you may be lucky enough to catch Jeff at the legendary jazz club and session musician haunt The Baked Potato or experience the more experimental side of his playing at Blue Whale with other like-minded musicians such as Mark Guiliana, Tim Lefebvre, Troy Zeigler, and Zach Danziger. Jeff was one of the first people to have both a Prophet-6 and OB-6, so–in addition to all his other accomplishments–he seemed like a natural for an interview. We caught up with him while he was on the road with actor/comedian Martin Short, for whom he has been the touring musical director and accompanist since 2002. My father was a music teacher, and my mother’s father was a music teacher, and my mother plays the piano, so there’s a lot of music in the family. As soon as I discovered the piano in my father’s office I was hooked. When it became clear that I wasn’t just banging on keys to make noise, they got me a proper piano teacher and I began formal lessons around age 4 or 5. At age 5 I began studying with Tessie Chiaco. She, in turn, introduced me to David Roitstein, who heads the jazz department at CalArts, and I started studying with him when I was 10. One time for my lesson, David said, “Today we’re going to forego the piano lesson and I’m going to show you how to get around a synthesizer.” He had a Prophet-5 and explained what cutoff frequency and resonance and envelopes were. I was hooked on synthesizers from that moment on. I was probably 10 or so when that happened. My neighbor also had a Roland JX3P. I remember showing up at school with that and playing “Jump” for the kids. I felt pretty popular. [laughs] But my first experience with synthesizers was with the Prophet-5 and I was always trying to get back to that. When did you first start playing with other people? I started playing with other people in junior high. I was always learning things off the radio or from my cassette tapes. I remember some guys from the high school poaching me for their kind of Japan/Bowie soundalike band when I was in eighth grade. That was my first rock band. And I was playing in the jazz band in school. I had a Prophet 600 for a while, but then I wanted to look modern because it was post-DX7 days. But I have to say, the sound of FM synthesis never felt warm to me. I always felt much more connected to analog synthesis. Now with this current wave of real analog, I feel at home again. What was the next evolutionary step for you? David Roitstein recommended that I study with his teacher at University of Miami. I wasn’t thrilled to leave LA. I really wanted to get my feet wet in LA and get working, get to meet people. So it seemed like a step in the wrong direction, except that I had met Bruce Hornsby when I was in high school, and he had gone to University of Miami. Pat Metheny had gone there. Jaco Pastorius. A lot of cool people had come through the school. It turned out it was the best thing I could have done, because it took me off the grid of LA and put me into a space where I studied with Vince Maggio, who was a very traditional, bebop piano teacher, very pianistic fundamentals guy. The other thing that was good was that I was working a lot. As soon as they found out a guy could read, blow, and get through a gig…I was working my second month in college at the Coconut Grove Playhouse playing the Anthony Newley musical in the pit 3 days a week. I wouldn’t have worked that much right out of high school in LA. There’s a million other guys who could do that in LA. Did your time at University of Miami help you network once you finished school? When I graduated, my band, Treehouse, came to LA to make it big. When I realized that wasn’t going to happen, I left and got an audition to do a world tour with Julio Iglesias starting from Miami. I’d say a good percentage of things ever since have been from connections I made there. Later I got a call to sub for my friend Mitch Forman, who is one of my keyboard heroes. He he was very kind to throw me some work and put my name out there. He had to bow out of a tour with Simon Phillips, so I ended up working with Simon. We did 3 or 4 tours, 1 live record, and a studio record with that band. Simon was playing with Toto at the time, so that led to me playing with Steve Lukather, and then with Toto on tour. Being a musician with big touring acts doesn’t always make for an easy transition to studio work. How did that happen for you? I never did a big pop tour. I’ve probably never been out more than 2 months at a time, so I never got pegged that way. By the time I was 30, there was enough work between work at home and short tour stints. The jobs weren’t always glamorous. But I was busy. I might do a Tim McGraw record, but then there’d be 13 people you’d never heard of, or a jazz record, or a singer/songwriter that was on his own label, that kind of stuff. But, you know, the engineer from that recommends you and three years later you get a call to do some big record. So I was just kind of planting seeds. I’m such a fan of music that a lot of time, if it was an artist I was familiar with, I was already kind of ready. My first TV gig was with Martin Short. I knew his comedy material, so when I auditioned for his TV show, it was an easy audition and I knew the band. Then I started doing the Kimmel show in the fall of 2002. I’m still working and touring with Martin Short as his musical director. Thankfully all of the connections I’ve made have been pretty long lasting. You seem to be very busy with the Kimmel show and studio sessions, but you’re also able to make time for your own projects, including some more experimental electronic things that are maybe more personally satisfying? Absolutely! For a long time I’ve had my studio at home and there’s a fair number of synths there, and a B3 and Rhodes. I’ve been playing Rhodes forever. On Kimmel I use standard workhorse keyboards, but for sessions that require more creative synthesis and sounds I’ll use the synths and pedals. I just got called to do a session with the Prophet-6 where they wanted a lot of analog sounding stuff. That happens a lot. I work in a lot of situations where I am hired to fulfill the needs of somebody else. Something needs to be played a specific way or with a specific sound. I’m a sideman. It’s a job, which I’m thrilled to be able to do. But that doesn’t necessarily fulfill my own creative urges. That means a lot of my free time is spent tapping into that creative side. So I always keep busy recording and gigging with different projects that satisfy that side of things. It’s important to me to get it out and to explore it. We did this record called Crow Nuts about a year ago and I thought, “Does anybody really care about this? Is this just an ego deal for me?” And then one guy that I know, who’s a great player and working, took me for coffee and said, “What’s that sound on the beginning of…?” So I think, “Oh, that’s why I made this record!” Even if there’s just one guy who wants to know what a sound was, those are the records that excited me when I was young and still excite me. I realize that it is giving back somehow, even if there isn’t the immediate gratification of millions of people. I have fun doing it. You’ve been a vocal promoter of the Prophet-6. Yes. The OB-6, too. They’re a beautiful team. The synths feel natural. They’re warm, they’re thick. 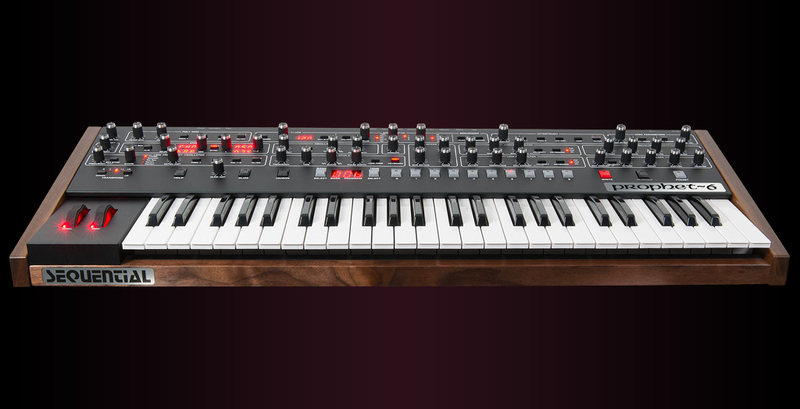 Both the Prophet-6 and the OB-6 have different characters, a different color. Clearly when you A/B them, they are different instruments. The layout is different, but the character is different, too. They are both solid, super exciting instruments. They are like children to me; I cannot choose one over the other. I think they are both really intuitive, remarkably musical instruments. They’re really great to have in my arsenal, because I feel like I connect with these instruments. I have Mono backpack bags for both synths. If I can show up with just a backpack and the raddest piece of equipment, that’s a pretty good day! I feel like I have this whole world of opportunity on my back. 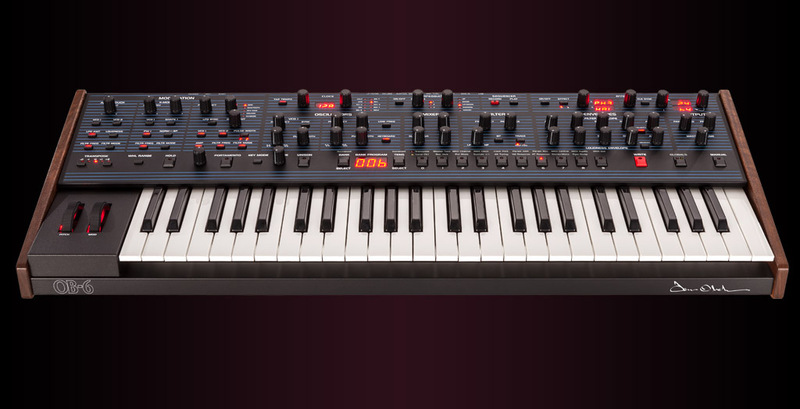 It takes me back to what initially excited me about synthesizers. Once I turn them on, it’s difficult to leave. The gates of opportunity just open and immediately these warm, interesting, dimensional sounds cause me to want to write music. They are a composer’s best friend. I’ve never been a real soft synth guy. Some composers like soft synths because they need to call up a sound, grab it, plug it in, and it works. I’ve always looked at it as: “I want to provide a sound — my sound.” If you’re a guitar player, you choose your Strat or your Tele or your Les Paul and you decide what you’re going to run it through. I’ve always felt that I was coming from the same direction. With these synths, I turn them on and call up a sound, but then I immediately tweak and get it to where it feels good to me and then that’s my instrument. It’s not just fulfilling a role, that’s my voice. Both of these synthesizers are such unique voices. They’re just brilliant instruments. Jeff was also responsible for The Caffeinated Keyboardist podcast. There are 8 episodes and may not be any more, but it still makes for good listening.